Penny blacks are not scarce, there were about 69 million of them. Our mail bid sales usually have 10 or more examples (please see County home page ). Stanley Gibbons list used examples at £200 but real market prices vary considerably depending on condition. A space filler might be in the £5 - £15 range and good, sound, fine used examples tend to be in the £45-£95 range. Those over £100 ($140) should be exceptionally nice examples or be a scarce variation (or which more later). They were issued in sheets of 240 and, being imperf, individual stamps were cut out with scissors. The gap between the stamps was not large and examples with 4 good even margins around the design are relatively scarce. Many examples have fewer than 4 margins and the design might be just shaved or even cut into. The dim light of gas lamps at the time did nothing to ensure each was cut out as a philatelic gem. The number of clear margins and their size is a key factor in determining value. 3 margin copies should seldom be over £40. Thins, creases, tears and neatness of cancellation affect value as for any other stamp. · It is the World’s first stamp and far more collectors than normal want to own one. · It is one of the most studied stamps and many collectors have hundreds of them. Why have more than one? · They were printed from 12 plates – 1a, 1b and 2 through 11 (plate 11 is scarce and good examples can be £500-£1000 or more). Unlike many later issues, the plate number does not appear on the stamps. Designation of the plate is a fascinating specialist study for which you need reference books. · In the sheet of 240 each stamp has different letters in the corners. There are 20 rows of 12. The top left corner stamp is lettered AA, the next is AB and so on across the sheet to AL. The next row is BA, BB, BC…BL. Then CA, CB….CL right through to the bottom row TA, TB … TL. · That means there are 12 x 240 or 2880 different stamps to collect. · Add to that number examples showing different colour cancels, different types of cancel and different states of plate repairs and it becomes clear why the demand is so high. 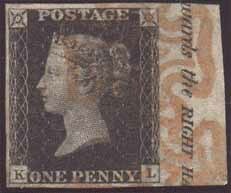 As mentioned above, the 1d black from plate 11 is relatively scarce – 700 sheets only. By the time this plate was used in February 1841, the red Maltese Cross cancel had been almost phased out in favour of black ink. A plate 11 with a red Maltese cross is rare; about 10 copies are known. Of these 10 only one example is known with marginal inscription. County Auctions has recently sold this unique item. It has a certificate of authenticity and is a lovely looking example but is expertly repaired. Gibbons list the plate 11 with red MX at £10,000. Needless to say our price was very much less.